Introduced in 1993 by Wyeth Pharmaceuticals, now Pfizer, Effexor was the first SNRI antidepressant. The U.S. Food and Drug Administration approved the medication (venlafaxine) to treat major depressive disorder, panic disorders, social phobia, and generalized anxiety disorder (GAD). What many people did not know was that Effexor side effects could be serious, and would be shown to include suicide ideation and possible birth defects if mothers took Effexor during pregnancy. What is Effexor? What are SNRIs? 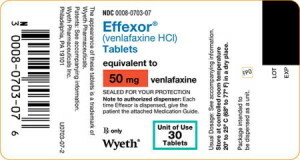 Effexor is the brand name for venlafaxine, an antidepressant in the serotonin-norepinephrine reuptake inhibitor (SNRI) drug class. When it was introduced in 1993, Effexor was the first SNRI drug to be sold in the United States. Like serotonin reuptake inhibitors (SSRI antipressants), SNRIs block the absorption of serotonin, an important neurotransmitter believed to be responsible for happiness, and thus preventing depression and anxiety. SNRIs differ from SSRIs in that SNRIs also block norepinephrine, a catecholamine (hormone-neurotransmitter) that can help reduce neuropathic pain. This is a type of nerve damage that can cause numbness or a tingling sensation in the legs, arms and other extremities. It can also cause hypersensitivity. As such, Effexor was also prescribed off-label as a treatment for severe migraine symptoms. The drug has also been used off-label to treat the symptoms of menopause. In general, SSRI drugs – Zoloft, Paxil, and Prozac, among them – are better known than SNRIs, but Effexor quickly shot to stardom, at least on the balance sheet. In 2007 alone, Effexor was the sixth-most prescribed antidepressant in the United States, and doctors wrote an incredible 17.2 million prescriptions for the drug that year. Wyeth Pharmaceuticals, the drug’s manufacturer, was acquired by Pfizer in 2009. In 2010, generic venlafaxine was approved for sale in the United States. One thing that SNRIs and SSRIs have in common: complications. Many of the most serious Effexor side effects are also seen in patients taking Paxil, Lexapro, Prozac and Zoloft. In 2004, it became public knowledge that SNRI and SSRI antidepressants could increase the risk of suicidal thoughts in children in adolescents. In 2006, the FDA amended its warning, upgrading the risk to include patients up to age 24. Notably, Effexor is not approved for use in young children, but it is legal to prescribe it to teenagers, and certainly young adults under age 24. Effexor currently carries a black box warning, the most severe, for suicidal thoughts. The risk is considered highest during the first two months of treatment, but is not completely confined to this time period. In the case of Effexor, too much of a good thing can be dangerous as excess serotonin, the neurotransmitter responsible for happiness, can result in a fatal overdose. Serotonin syndrome is sudden-onset, meaning that it occurs out of the blue, usually without any warning signs. Sudden symptoms can include high body temperature (hyperthermia), increased heart rate (tachycardia) and high blood pressure. If not treated immediately, serotonin syndrome can cause shock and result in death. Effexor patients may also experience discontinuation syndrome, a type of serious withdrawal if the drug is stopped suddenly. The symptoms of discontinuation syndrome include stomach cramps, severe headaches, disorientation, extreme fatigue and poor coordination. Some doctors may recommend a switch to SSRI drugs, which have less severe withdrawal symptoms, before weaning patients off of SNRIs like Effexor. Antidepressants have long been associated with risky pregnancies and serious SSRI birth defects, and Effexor is no exception. Though the SNRI was first marketed as a safe choice for pregnant women, later studies suggest that Effexor birth defects can be severe, permanent and even fatal. As a result, pregnant women, or women who may become pregnant, should only use Effexor when no other, safer alternative is available. In 2006, the FDA ordered all SNRI drugs, including Effexor, to add a birth defects warning for persistent pulmonary hypertension of the newborn (PPHN). The severe lung disorder can result in death. In 2012, the Canadian Medical Association Journal published a study showing that Effexor could double the risk of spontaneous miscarriage. As a result, it was recommended that women limit use of Effexor during pregnancy to cases where no alternative, safer options exist. Why file an Effexor lawsuit? People file Effexor lawsuits for many reasons, but the primary purpose is to recover damages associated with the drug’s debilitating side effects. For many plaintiffs, these include the financial hardship – sky-high hospital bills, medical equipment, lifestyle changes, etc. – directly associated with their Effexor side effects, or with children’s birth defects. Other types of financial burden include loss of past and future wages, loss of earning capacity, and other calculable losses that result from exposure to the drug. Additionally, an Effexor lawsuit can help compensate for emotional distress, pain and suffering, loss of consortium (loss of companionship), and other intangible damages. Punitive damages also seek to punish Wyeth for creating and marketing a drug they allegedly knew was dangerous.